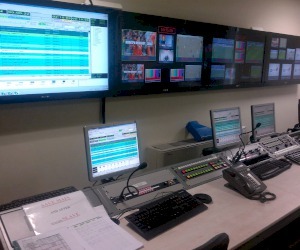 The project includes three SD and one HD continuities, with N+N redundancy for both video servers and automation. The material is ingested directly to a central FC storage of 60TB capacity. The system has 2 NLE for editing material. 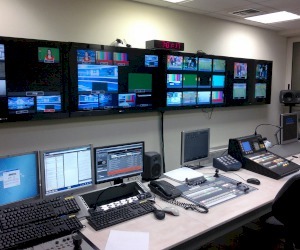 It should be noted that there is an interface with the existing production and archive system of SKAI TV.The production studio includes 3 robotic cameras with 1.5M/E vision mixer, a 32ch audio mixer, a 2ch production server and a CG. The heart of the baseband system is an EVERTZ router with integrated multiviewers, the MCS’s are also from EVERTZ, the interfaces are from CRYSTAL VISION, production server from OMNEON, cameras, vision mixer and NLE’s are from SONY. All the transmission and ingest servers, the automation and the Traffic & Scheduling system that handles the continuities are from VSN.